Dell today unveiled their first Windows phone 7 based smartphone Dell Venue Pro. Earlier known as the Dell Lighting, Venue Pro looks very similar to its Android brother the Dell Thunder. Dell Venue Pro has a 4.1 inch wide, AMOLED captive touch screen, which supports multi-touch inputs. Apart from this, Venue Pro has a QWERTY keypad fixed in the portrait orientation. We all expect a landscape keyboard in such a device with huge screen, but Dell managed to incorporate a four row keyboard in Venue Pro, which is easy to access operate. 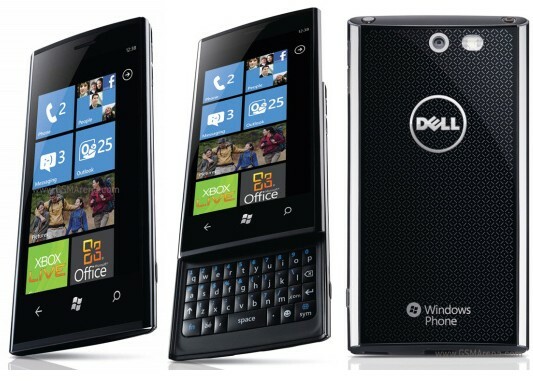 Dell Venue Pro meets the demands of the new Windows Phone 7 OS with 1GHZ Snapdragon processor. There is touch sensitive menu, back and search keys at the front side, and a 5MP camera with LED flash in the rear side. The gorilla glass screen technology used in Dell Venue Pro is similar to that in Galaxy Tab, iPhone 4, Droid X, Samsung Galaxy S and some other high profile handsets. Therefore, the screen is strong, scratch resistant and super responsive. Dell Venue Pro uses the default Windows phone 7 UI and applications. The external design of the Venue pro is very appealing, especially the chrome sidelines and the curved screen. It has 3.5 mm headphone jack at the top side and a Micro USB port at the bottom. Dell Venue Pro comes with 8GB internal storage and a 5MP camera which also supports HD video recording at 720p. Other features of Dell Venue Pro smartphone include Bluetooth 2.1 with A2DP, HSDPA, HSUPA, EDGE, WLAN, A-GPS, MS pocket office, Youtube client, social networking apps and 1400 mAh battery. Dell Venue Pro will be launched with the T-Mobile network in USA around this Christmas season. Europe and Asian versions are expected in the Q1 of 2011. Dell hasn’t announced the price plans of the Venue pro handset. However, we believe that it would cost $199-299 with a contact and around $600 without one. Update: Dell Venue Pro will cost 500 pounds or $780 in UK .